The time: last week. The task: terraform planet Mars into a habitable planet. Val Kilmer, Carrie Ann Moss star in Red Sydney! Here's a short video showing that alien world of red dust. No, wait. 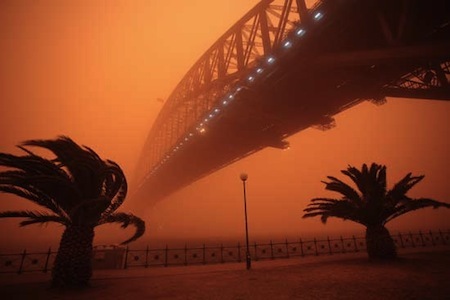 Those images are from Sydney, Australia, this past week, when an enormous dust storm 310 miles wide and 620 miles long blew through the eastern part of the country. The storm was visible from space, if not from Mars. Here's the real (movie version) Red Planet, in a short video. And here's a look at the real (real) red planet; the video is compiled from data collected by the Mars Reconnaisance Orbiter and Spirit. 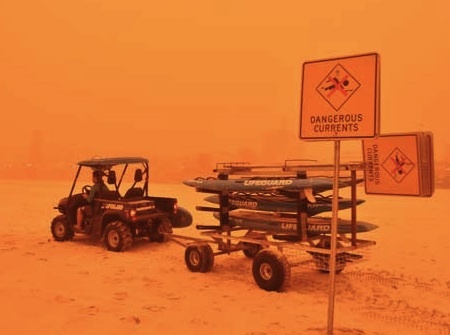 Via Massive dust storms transform Australia.